After selecting a base cable package, customers are able to select channels to add on a channel-by-channel basis. One of the big complaints that folks have with cable providers is bundled pricing. Having to upgrade to a more expensive package just to get the one channel you want is an inconvenience to say the least, and it makes you choose between paying a substantial amount of money or just missing your shows. The folks at Rogers cable in Canada are trying something out that could have a huge impact on how cable and satellite operate if it's a success. 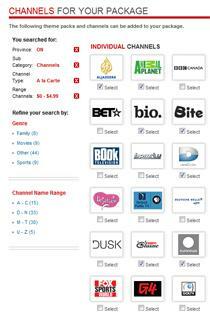 That something is an a-la-carte subscription model that allows you to select and pay for only the channels you want. A quick exploration of their site reveals some of the pricing details. After selecting your base package you can add channels for $2.69 each. Depending on your needs, this could be a great deal.